"I met your beloved Mom Darlene almost 20 years ago. She was an awesome and an amazing woman. I was sadden to hear of her passing. May Darlene..."
"I,m so sorry for the pain you are going through.. May God be with all of you and ease your pain in this tough time.. "
Graveside services for Darlene J. Abbott age 81, of Hollister, Missouri will be held at 1:00 PM, Thursday, September 27, 2018 at Lewallen Cemetery under the direction of Greenlawn Funeral Home in Branson. 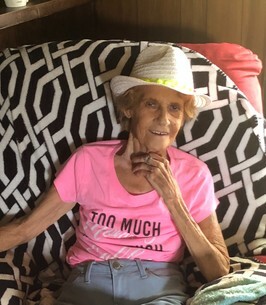 She passed away on September 23, 2018 at her home in Hollister. Darlene was born on March 5, 1937 in Red Oak, Iowa the daughter of Novie and Bonnie Buffon Milgrove. She had been a resident of the area for many years and had owned and operated several businesses during this time. Survivors are two children: A. G. Abbot of Branson, Missouri and April Darlene Godat of Hollister, Missouri, 1 brother, Kenny Milgrove of Red Oak, Iowa, two grandchildren and two great grandchildren. She was preceded in death by her parents, her husband, Doug Abbott and four brothers and four sisters. To plant a tree in memory of Darlene J Abbott, please visit our Heartfelt Sympathies Store. I met your beloved Mom Darlene almost 20 years ago. She was an awesome and an amazing woman. I was sadden to hear of her passing. May Darlene Rest In Peace, and may you all always remember the wonderful times that you all had together. May God watch over you today, tomorrow and for always. We hope her journey into the next dimension is short and fine, fun and funky. I,m so sorry for the pain you are going through.. May God be with all of you and ease your pain in this tough time..
AG, April and families: Please know you are in the thoughts of many at this time of loss. Darlene was a sweetie and will be missed by many. Love to both of you from the Jones and Abbott cousins. So sorry for your loss. She was a friend who cared deeply for others. Dear Abbott Family, I'm sorry to learn of Darlene's passing. I hope your warm memories of her will give you some comfort at this difficult time. Prayer to God for comfort will also help you to cope with your loss. We can look forward to the time when sickness and death will be no more as stated in the Bible at Revelation 21:3,4.